The new British Standard became effective on 30th June 2011 and employers are responsible for ensuring that First Aid provision and First Aid Kits are kept up to date and are appropriate for treating any injuries that could arise on site. Employers are required to make a risk assessment to decide what the hazard levels are and how many employees are involved in the area to be covered. The following guide is a suggestion for matching risk and employee numbers to the appropriate kit size. High hazard e.g. light engineering and assembly work, food processing, warehousing, extensive work with dangerous machinery or sharp instruments, construction, chemical manufacture etc. 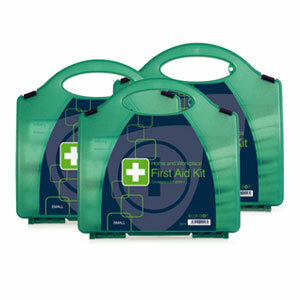 Available individually or any quantity to suit the needs of your organisational first aid kit requirements.